Slow Roasted Roast Beef, mashed avocado, roasted red pepper, lettuce, colby pepper jack, and chipotle aioli and sandwiched together between whole grain bread for a delicious sandwich. I’m a sucker for a really delicious sandwich. 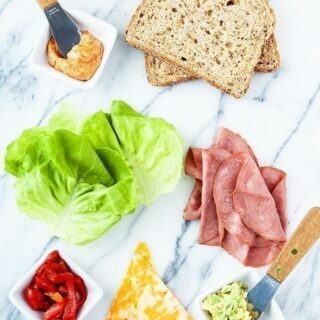 Luckily, once you recognize some of the key elements to prepping a great sandwich, it isn’t that hard to prepare deli-style creations at home…and for a fraction of the price. This Chipotle Roast Beef Sandwich with Avocado and Roasted Red Pepper might sound super fancy and complicated, but it can be whipped up for a quick lunch in just a few minutes. Thanks to some creative filling ingredients and quality Oscar Mayer Selects Natural Slow Roasted Roast Beef you can enjoy a deli-style sandwich at home. 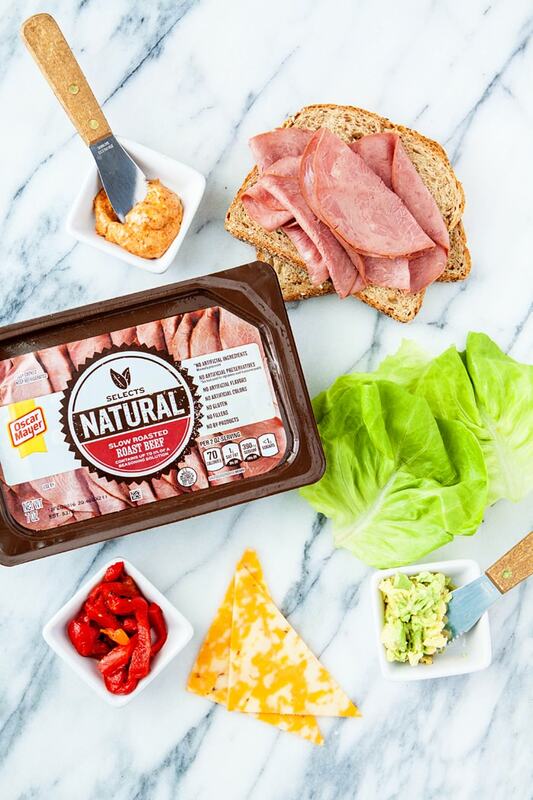 Take your sandwich to the next level by pairing these 5 simple steps with Oscar Mayer Selects Natural, the perfect choice for anyone looking for quality cold cuts that have no artificial ingredients and delicious taste. 1. Use a Quality Meat. For meat, I like Oscar Mayer Selects Natural because it has no artificial preservatives, no artificial flavors, no artificial colors, no gluten and no by-products. The 5 varieties (Slow Roasted Turkey, Applewood Smoked Turkey, Rotisserie Seasoned Chicken, Applewood Smoked Ham and Slow Roasted Roast Beef) are readily available at my regular grocery store. It is an easy, better-for-you option. Usually, being creatures of habit, we tend to use a lot of ham and turkey around here for our sandwiches, so this time I decided to mix things up and use Oscar Mayer Selects Natural Slow Roasted Roast Beef. I loved the way the flavor of the meat paired with the chipotle aioli, avocado and roasted red pepper. 2. Change Up the Bread. 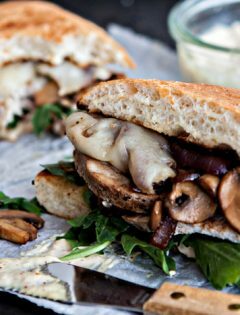 Whether it is with baguette, a wrap, focaccia, or a bagel you can add a little more style to your sandwich if you stray from sandwich bread. If using a more traditional bread, look for a hearty whole grain, like I’ve used in this Chipotle Roast Beef Sandwich with Avocado and Roasted Red Pepper. 3. Spread it with something other than mayo and mustard. Aioli, pesto, tapenade, guacamole, herbed cream cheese, or Italian dressing are some of my favorites. For this sandwich, I made a super simple Chipotle Aioli by combing and Olive Oil May with smoked paprika and chipotle powder. 4. Grill, toast, or broil it. This can change a lot: melted cheese, a hot sandwich, crispy bread, all of these change the feel of the sandwich. For this Chipotle Roast Beef Sandwich with Avocado and Roasted Red Pepper I chose not to include this option, but you could definitely toast the bread and melt the cheese if you wanted. Look around in your fridge for what you already have on hand and you’ll be inspired to create new combination. Sandwiches are a great way to use up remnant ingredients from previous meals – I had a jar of roasted red peppers leftover from another recipe, and an extra avocado that I didn’t need when I made some guacamole last weekend. I didn’t have to purchase any of the ingredients listed in this recipe for the sandwich (other than the Oscar Mayer Selects Natural Slow Roasted Roast Beef) because I already had them in my fridge. 6. When all else fails, take inspiration from your favorite deli menu. 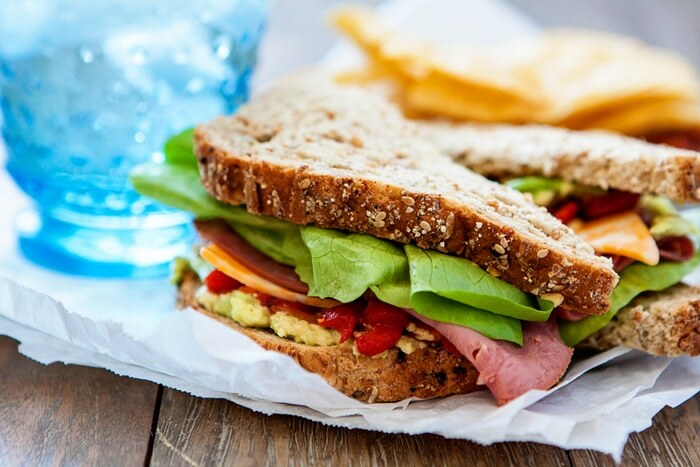 Most deli sandwiches are not that difficult to recreate at home. A simple glance at the ingredient list or sandwich name can give you all sorts of inspiration, and may even spark a completely new idea. 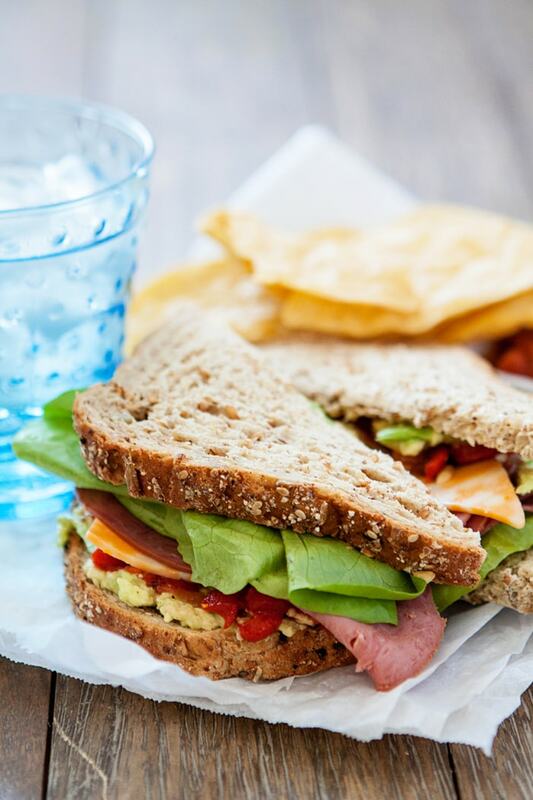 I love that this Chipotle Roast Beef Sandwich with Avocado and Roasted Red Pepper contains a quality, preservative-free meat paired lots of colorful and flavorful ingredients. What is your favorite way to make a sandwich? In a small bowl, combine the Olive Oil Mayonnaise with the Smoked Paprika and the Chipotle Powder. Mix Well. Spread the Olive Oil Mayonnaise mixture on one side of one of the slices of bread. Next, top the mayonnaise mixture with the lettuce, followed by the Oscar Mayer Selects Natural Slow Roasted Roast Beef, cheese, and red peppers. Set aside. On the second slice of bread, spread the mashed avocado on one size. Place this slice of bread avocado side down on top of the rest of the sandwich. I like this served with a small serving of tortilla chips and salsa on the side. I have partnered with Oscar Mayer/Kraft Heinz to create this sandwich recipe. I have been compensated for my time, but all opinions are my own.